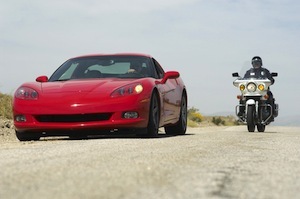 While car chases are often a staple of action movies and news reports, evading a peace officer in a motor vehicle is in reality a criminal offense under California Vehicle Code Section 2800.1 VC that can lead to serious penalties for those convicted. A vehicle is considered to be distinctively marked if it has features that are reasonably noticeable to other drivers, including a red lamp, siren, and at least one other feature that makes it look different from vehicles that are not used for law enforcement. A man driving in his car notices flashing red lights behind him on his way home. He looks in his rearview mirror and sees a marked police squad car with flashing red and blue lights accompanied by sirens. He also notices that the driver is not wearing a standard police uniform but instead has a vest marked “police” with a visible badge. The man does not stop and tries to drive away from the officer over the course of several miles. This man could be charged with misdemeanor evading a peace officer in violation of California Vehicle Code Section 2800.1 VC. Courts have held that wearing a marked police vest satisfies the “uniform” requirement. In another example a man has heard about criminals who put flashing lights on their vehicles and attempt to pull over unsuspecting motorists, only to rob them. One night, he notices flashing red lights behind while driving on a desolate stretch of road. The man is frightened that he may be a victim, so instead of pulling over right away, he drives slowly for a couple of miles until he reaches a local police department, at which point he stops his vehicle. The man would not be guilty of evading a peace officer because he lacked the requisite intent to evade the officer as required by statute. As mentioned above, if the defendant did not specifically intend to evade the officer, he or she would not be criminally liable for this offense. Additionally, if the defendant did not realize that he or she was being pulled over, he or she may have a valid defense depending on the underlying factual circumstances involved. Evading a peace officer under California Vehicle Code Section 2800.1 VC is a misdemeanor offense that is punishable by up to a year in jail and a $1,000 court fine. In addition, those convicted of this offense are subject to having their car impounded for up to 30 days. If you have been charged with evading a peace officer, it is very important that you consult with a knowledgeable Los Angeles Criminal Defense Lawyer right away. As a former Deputy District Attorney with over 14 years of prosecutorial experience, Los Angeles Criminal Defense Attorney Michael Kraut knows how to properly and effectively defend these types of charges. Mr. Kraut understands that there may have been extenuating circumstances when the incident occurred and works hard to make sure his clients receive the best defense possible. For more information about evading a peace officer and to schedule your free consultation, contact Los Angeles Criminal Defense Lawyer Michael Kraut at the Kraut Law Group located at 6255 Sunset Boulevard, Suite 1480, Los Angeles, CA 90028. Mr. Kraut can be reached 24/7 at 888-334-6344 or 323-464-6453.